To execute on multi-billion-dollar transformations of our regional economy and environment, I've started assembling a team of world-class professionals with diverse, global, very large systems reengineering expertise. Our lead architect Richard Fleischman expressed the first great vision for our initiatives: to make Northeast Ohio home of the first "Digital City" and the Greenest Place on Earth. "Digital" and "city" have many interpretations but the objective is most simply to make the region the "smartest" place with information and technology ("smart city"), which I call being the "brightest" place. Our mission is for REAL NEO to be the Brightest Greenest Place on Earth... making this the greatest place on Earth to live, work and play! We propose to do this as "Open Source" as possible, through open planning and development, and open source technologies - REAL COOP - putting that at the core of our region's future workforce and economic development, to the tune of $ billions in economic growth. And we propose to do this by improving the health and well being of all citizens, and addressing our "food security", through development of our "Local Food" infrastructure, workforce and economy, to the tune of $ billions in brightest greenest new economy. How we accomplish this offers great regional and individual opportunity for our current and future seven generations, who are all the 21st century stewards of our planet responsible for bringing human life into sustainable balance with the rest of nature on Earth. 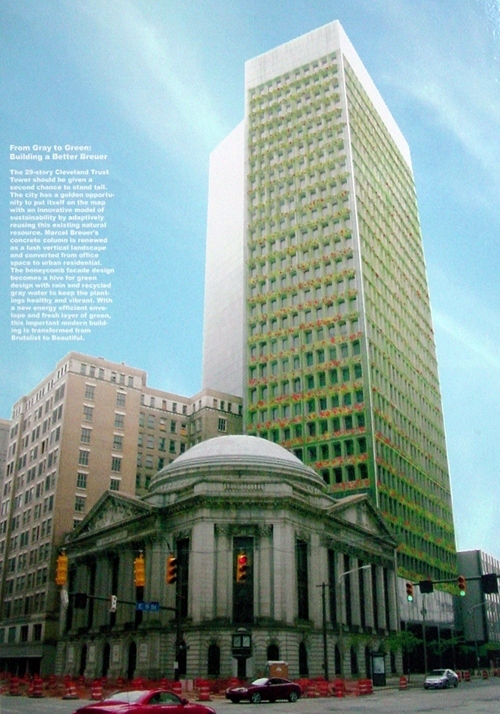 The above rendering of the world-renowned Breuer Tower, in Cleveland, Ohio, from a 2007 competition to reimagine the future of this landmark structure, offered the world its first full-view of the brightest greenest citizen driven Northeast Ohio of REALNEO and our cooperative future - our citizen initiative is now being globally celebrated for helping drive the brightest greenest decisions about our future, as determined by informed citizens empowered with the brightest technologies in the world. The Breuer will be saved and should be made an integral symbol and center of the brightest greenest region in the world - world headquarters of our brightest greenest citizens - NEO Bright Gov Center, Downtown REAL NEO, Ohio. We the citizens already own this landmark, and the right to vision its future. Ten years and $ billions from now, in 2020, Brightest Greenest Downtown NEO will in many ways resemble turn-of-the-21st-century Cleveland, through preservation of important architecture, infrastructure and public transportation grids, but all life in NEO will be reborn by our brightest greenest citizens, through world-class information, communications and technology. How we spend the next ten years and $ billions here is the responsibility of REAL NEO - the real people here - who are all part of REAL COOP and are its beneficiaries. As abstract as this concept may sound, it is what will always differentiate our region - our citizens - our initiatives going forward - from all else on Earth... we are a cooperative! I have now submitted to the leadership of Cuyahoga County government a rich portfolio of integrated regional economic and workforce development solutions, derived from within this community, with specific proposals for how our brightest greenest leadership may work with citizens to save our home, economy and future. I will post all the material now in general circulation here in this book on REALNEO, so all citizens may participate in our planning going forward, and benefit from all our hard work here innovating this region to date. Most of this information has been posted on REALNEO for some time, and much of the concepts were developed real time here, so our initiative has been developed very openly, with those really paying attention and participating in this community. I did not previously post all this as a single proposal, nor have I previously shared this with County leadership as such, because of bad experiences in this community with non-government organization leadership co-opting valuable intellectual property from myself and others and abusing the opportunities created by others, largely to poor results for all. To keep the initiatives proposed to Cuyahoga County pure and free from interferences, I prefaced all I submitted to the County leadership with a Preamble, surfacing concerns about poor behavior in the community that was interfering with development of our open source initiatives here, and I did not disclose to anyone unnecessary information going forward, until it was time to present that to County leadership. I apologize if that has left anyone feeling excluded from information or my planning, as that has not been the objective and all planning has been promoted on REALNEO and all members have always been welcome at the core, as is the case today. And, even as careful as I have been to keep our plans on target and cooperative, within a dedicated core planning team, there are people in the community who are attempting to fork and co-opt the work of this cooperative. It is that bad here in unreal NEO. In moving forward with all the work put forth here, and launched by or through REAL COOP and the public in the future, it is my expectation individuals intellectual property will be respected as the property of the creators and those with whom they choose to share their opportunities, and of the cooperative as we as a cooperative and the members agree. Enjoy the plans developed for the cooperative, so far, and add your input... we all look forward to full public participation in all future planning, development and transformation of this region, which is fully enabled by the work of this cooperative going forward. Submitted by Norm Roulet on Wed, 08/11/2010 - 18:05. Submitted by Norm Roulet on April 14, 2007 - 5:17pm. Submitted by Norm Roulet on April 15, 2007 - 12:54pm. Submitted by Norm Roulet on April 15, 2007 - 8:16pm. Submitted by Norm Roulet on April 15, 2007 - 9:05pm.